Huawei today launched its Mate-10 series of smartphones at a high profile event in Munich, Germany. That it chose to do so on a day that was declared as, ‘Steve Jobs day’, is likely just coincidence – it happens also to be Huawei’s 30th birthday. Nevertheless, there are a few parallels between the new Mate 10 and the recently launched iPhone 8 series and iPhone X, not least the inclusion of a neural processing unit (NPU). The devices themselves have more in common with the iPhone than the inclusion of the neural network engine. The Mate 10 launch includes three flavours of the device – the most prominent is the Mate 10 Pro that sports a 6″ OLED 18:9 display in a svelte glass-backed design that’s IP67 water and dust resistant. This is analogous with the iPhone X in as much as it will likely overshadow its more conventional stable, er, mate. The regular Mate 10 looks rather similar to the Mate 9 it supersedes. It’s 5.9″ IPS display is in the 16:9 aspect ratio. Consequently it looks a little larger than the Mate 10 Pro despite the smaller diagonal display dimension. Both Mate 10 and Mate 10 Pro exceed the iPhone X screen to body ratio, without the controversial ‘notch’ design that has caused much discussion (and derision) of the iPhone X design. The uncomplicated nature of the Mate 10 Pro display will likely make its production more straightforward than either iPhone X or the Xiaomi Mi Mix 2. This will streamline production and should assist Huawei to get product to market efficiently. The Mate 9 series also included a ‘Pro’ model, but it was not widely distributed. By contrast expect the Mate 10 Pro to be the primary focus for Huawei this time around with Europe for example being largely ‘Pro’ only. In addition, and also like the Mate 9, Huawei is again offering a Porsche Design version that will likely attract a high price but little volume. It does however provide some positive brand association. Core to the Mate 10 experience will be the Hisilicon Kirin 970 SoC that powers the device and that Huawei launched in September at the IFA trade fair. The Kirin 970 is built on TSMC’s 10 nm process node. It contains an octacore CPU, an ARM Mali GPU and up to Cat 18 LTE modem with the ability to run LTE simultaneously on dual SIMs including VoLTE. However the Kirin 970 stands together with Apple’s A11 Bionic chip as the only other current smartphone application processor with a dedicated NPU. We learned that the NPU design was IP from Cambricon Technologies – a Chinese chip design and IP licensing company that was founded and is staffed by a raft of young PHD’s. We understand that Huawei has worked closely with Cambricon to jointly develop the NPU, and Huawei’s license will allow it to scale the capability broadly. The NPU design shares some similarities to that of Google’s TPU and NVIDIA’s Tensor core. Importantly, Huawei is opening its NPU to developers through a variety of APIs. The device will support Google’s Tensor Flow, Tensor Flow Lite, and Caffe and Caffe 2 frameworks. What this implies is that the Mate 10 will be one of the first Android devices that will drive the AI platforms of the leading AI developers – notably Google. However it may also mean that Huawei is subordinate to the AI-mediated services of other companies. Huawei has trialled AI-type features in China with its Honor Magic smartphone, which was launched in late 2016. It’s possible that Huawei will apply the learning from the Honor Magic platform to the Mate 10. Google GMS services are not available in China, so the performance and services offered on the Mate 10 in China are potentially somewhat different to those experienced in international markets, though this is speculation on our part. Imaging will again be a stand-out feature of the range. Huawei has profited from its association with Leica; it was arguably the feature that elevated Huawei into the big-league with the P9. For the Mate 10 the familiar dual cameras are again in evidence. And again sporting the higher grade Summilux lenses. Summilux being the name that Leica reserves for its fastest lenses. In this case the Mate 10 offers super-wide f1.6 appertures for both cameras, meaning great low light performance. The optical performance is backed up with dual image processing units. The AI capability of the NPU will be brought to bear in various applications, however imaging is likely the one that most people will experience, and appreciate, most often. The Mate 10 is able to recognize objects and apply appropriate camera settings. These settings are based, in part, on having recourse to a database of millions of professional images that it has analysed to identify the best possible settings to achieve quasi-professional results, across a range of situations. In our brief hands-on experience, Huawei has clearly nudged the photographic bar quite a bit higher. Unlike Apple however, Huawei is foregoing wireless charging and instead relying on its Super-Charge, fast-charging technology. This is arguably more useful to the average user: you can add significant battery autonomy with 30 minutes of charge; you can use the phone while it’s charging; and it’s more efficient, so uses less power to recharge the battery. Huawei has also taken the smart step of getting its charging technology certified by TUV Rheinland, an organization that does nothing but safety-test consumer products – something that with hindsight, Samsung likely wishes it had done with the ill-fated Galaxy Note 7. One of the casualties of moving to IP67 water and dust-proofing is the loss of the 3.5mm jack socket; Huawei is moving to the Type-C USB port alone in the Mate Pro (the 3.5mm jack plug remains in the Mate 10, which does not benefit from the IP67 treatment). Huawei is not providing a USB-C to 3.5mm dongle in the box, which seems a bit mean, but thanks to Apple, many are available in the aftermarket. Some commentators will complain about the loss of the venerable 3.5mm jack socket, but it’s a compromise that is likely to become increasingly common in future. The Mate 10 pricing unashamedly places it firmly in flagship territory. 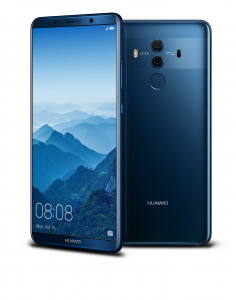 The Mate 10 starts at Euro 699 (~$825), while the Mate 10 Pro weighs-in at Euro 799 (~$940) – close enough to the iPhone pricing (somewhat depending on exchange rates and albeit with higher memory capacity than the Apple devices) to make Huawei’s ambition to be seen and respected as a top tier player plain for all to see. 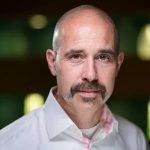 Whereas the Mate 9 was announced in November 2016 but was not widely available before the first quarter of 2017, we expect Huawei to have product shipping to stores before the end of October and reasonably widely available during November – the Mate 10 Pro perhaps a couple of weeks later than the Mate 10. The Mate Pro will take the lead in some markets with the Mate 10 in others – the Pro in those with stronger operator involvement in handset distribution. With pricing that meets and in many cases exceeds Samsung Galaxy S8 and Apple iPhone 8, Huawei is showing its confidence in its new flagship products. While the products are undoubtedly excellent, the Huawei brand still has a lot of ground to make up on Samsung and Apple. Nevertheless, we expect the Mate 10 series to receive strong operator support in many markets and this will help sales. 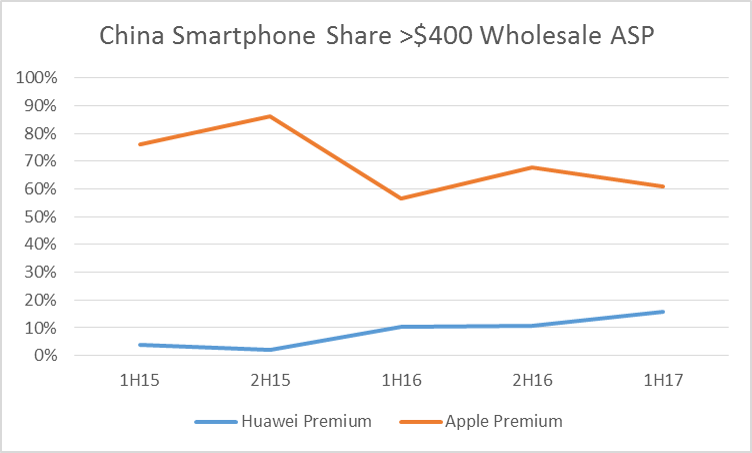 Huawei has done well in the premium sector in China versus Apple over the last two years and we expect the Mate 10 to be able to compete strongly against iPhone X in the China market. In Europe, the Mate 10 (Pro for most of Europe, except Spain, which will get the Mate 10) will shore up a strong third position overall, with second positions in some markets such as Italy and Finland. The Pro will likely be ranged by the key European operators. Deutsche Telekom is already taking pre-orders, though it was the only one of the main operators we found advertising the Mate 10. Most operators and retailers are still gushing about the iPhone 8 and iPhone X.
Huawei had previously expressed some confidence in breaking into the US market. However there is still little prospect of that eventuality (for our analysis on reasons why see here). While not a disaster, given the cost and administrative burden of maintaining the business relationships with US-based carriers, it will limit Huawei’s global market share potential. Similarly, there is little prospect of Huawei cracking the fast-growing India smartphone market with this product. Between the Mate series and P-series, Huawei is steadily building a powerful franchise that reaches across the business-orientated to fashion-orientated market segments. Its mid-range ‘lite’ variants provide strong market share drivers in the mid-range. The Mate series can be seen as important for multiple reasons and will keep Huawei riding strongly as the world’s third-largest smartphone manufacturer. Expect the 1Q18 launch of the next P-series to feature similar capabilities as the Mate, but in a slightly more compact package.